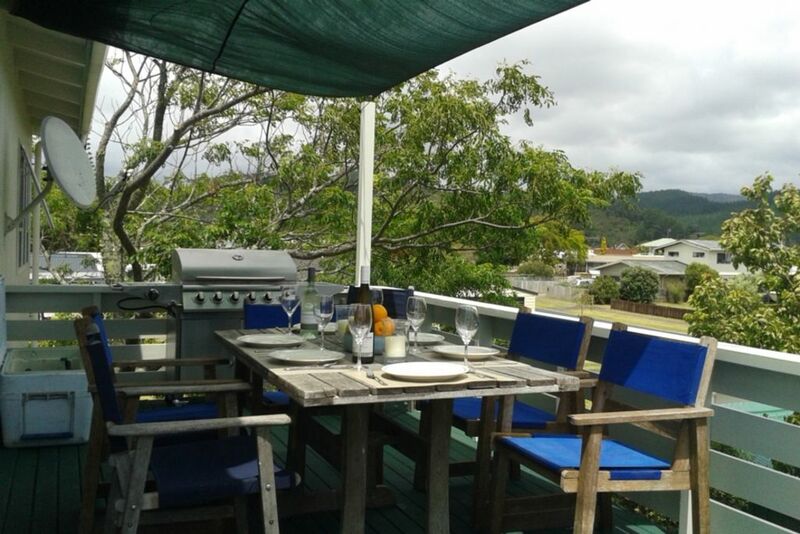 This large two storey house is 2 minutes walk to the shops and cafes, only 600m flat walk to the main Whangamata Beach. It offers all the amenities and space required for a relaxing break and a full site.Two bedrooms and large rumpus room downstairs, two bedrooms and lounge/dining upstairs. The rumpus room downstairs provides an area for children/teenagers to chill-out away from adults. Very sunny house. Timber-floors and carpeted throughout. Fully fenced back yard is perfect for summer cricket games etc. and very safe for children. Ample off-road parking for cars and boats. The ability to walk through the back gate to cafes, shops etc means there is no need to use the car, adding to the relaxed atmosphere of the holiday. Great place to stay, close to everything and clean and tidy. This is the perfect holiday home, so close to everything and the house was well equipped. We had a great time! Great location, close to the shops! Clean and lots of space with a large garden and big deck. Owner is really flexible and easy to contact! Great property .Location and amenities spot on. Such a convenient awesome location! Will definitely be renting again.